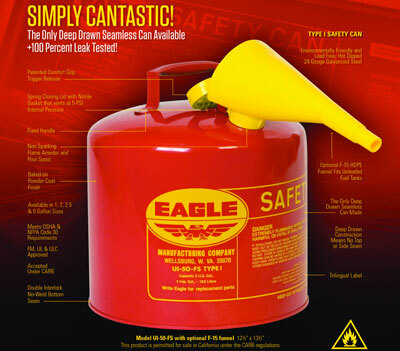 OSHA requires safety cans for flammable liquid storage for all industrial applications. Keane Fire and Safety sells a variety of UL and OSHA approved safety cans to suit any commercial or industrial facility. OSHA defines a safety can as "an approved container, of not more than 5 gallons capacity, having a spring-closing lid and spout cover and so designed that it will safely relieve internal pressure when subjected to fire exposure" (1910.106(a)(29)).